As any visitor will attest, Glenstone is a veritable paradise with grand vistas, serene walking paths, and stunning art. This magnificent place is the result of the conviction of its founders, Mitchell and Emily Wei Rales, who deeply believe in the restorative value of, and the connection between, art and nature. That belief manifests in how they operate and manage their institution. Learn about one of the newest Certified Green Businesses that just opened its doors in Montgomery County, Naturepedic, and its organic, toxic-free mattresses. Montgomery County, MD farms can now be certified as part of the County's Green Business Certification Program. Discover how these farms are helping the environment, their crops, their business and their employees by going green. For CNSI, a Rockville-based health information technology company, environmental sustainability is central to its corporate culture and work ethic. Importantly, their Green Business Certification is not viewed as a distinct add-on to the company’s strategic objectives. Get certified by December 31st and you’ll be featured on a County Bus! The Green Business Program loves providing recognition and exposure for our amazing Certified Businesses. Beginning in mid-August, almost 30 certified businesses will be featured individually on a County bus PSA displaying their company name and logo. When you see one of the PSAs, please snap a photo and share on Twitter using #MyGreenBiz. So Get on the Bus! and join the expanding network of Certified Green Business leaders. If you complete your Green Business Certification by December 31st, your business will be featured on a bus in 2019! Advertisements will last for at least four weeks at no cost to your business. First come, first served given limited availability. Get your application in as soon as you’re able since the verification process can take weeks, if not months, depending on the certification standard most applicable to your business. The two companies were recently recognized by the Maryland Department of Environment as part of the Green Registry Leadership Circle, a one-year designation given to past Green Registry award winners for their continued commitment to improvement through the implementation of significant new sustainable practices and results. Congratulations! Bethesda Green’s incubator is a four-year program, starting with an intensive six-month accelerator, designed to help provide start-up green and social impact businesses with the tools they need to succeed. The entrepreneurial businesses being “hatched” from the incubator are purpose-driven, specifically addressing today’s sustainable food and environmental challenges. Known as the Be Green Hub, it kicked off in 2009 as the first sustainability-focused incubator in the DC metro area. Since then, the incubator has assisted 44 companies– and 80 percent of them are still operating today. For businesses that participate in the program, establishing a strong business network, mentorship and technical support are just some of the perks the incubator offers. DGrid Energy–a maker, assembler, integrator, and distributor of a solar-powered expandable energy station and walk-in refrigeration system, called the Solar Cool Cube System – is one of several businesses currently in the Hub. Incorporated a little over two years ago, the company provides cold storage to off-grid locations, primarily in economically developing countries. The Solar Cool Cube can help eliminate post-harvest loss and reduce food insecurity. “We are in discussions with officials in Puerto Rico, Rwanda and other countries, and they seem to feel that we are a perfect solution for their rural and off-grid areas,” said Eugene Faison, founder of DGrid Energy. Although Faison said his company has already successfully sold units around the world and developed a pipeline relatively rapidly, their method of how best to identify customers was a bit different than what the Hub’s curriculum prescribed. “We had worked on our mission and vision early on. However the curriculum and expert counseling we received at Bethesda Green helped us rethink and change our vision, mission and values. The process made it stronger for us and more relatable to our clients,” said Faison. Eugene Faison, founder of DGrid Energy. For Urbanized, a Be Green Hub member that creates eco-friendly products from recycled coffee grounds, starting with an exfoliating soap, inspiration about molding the company into more of a lifestyle brand came directly from a Hub workshop about vision and long-term impact. When the partners were looking for information on how to expand via networking events and meet-ups, Arnal said the Incubator program was one of the suggestions they received. Juan Manuel Balcazar, another co-founder of Urbanized, says, "The curriculum is great. Each week we benefit from different speakers and touch topics like lean start up, pivoting, customer discovery, and as a result we rethink a lot about the way we're managing our business. Ever since we joined Be Green Hub we've become much more of a visionary company, we have become better at our methodology, and we have become much more professional as well. The curriculum is really helpful and the networking is also very good." The application process includes submission of a business plan and interviews to determine acceptance. Selection to the program is based on criteria that include revenue and impact potential and an evaluation of the team that puts the business plan into action. Accepted companies have the benefit of free co-working space for the first six-months, customized financial and operational mentorship and a host of other professional services. “I asked Mentor Capital Network founder Ian Fisk for the three top incubators in the area and he recommended Bethesda Green. We applied and he was correct," Faison said. According to Arnal, applying was not as nerve-wracking as the founders anticipated. “They were very clear as to what they were looking for. It just requires some time,” he said. The Be Green Hub will next be accepting applications in the Fall. For more information about the Be Green Hub and its companies, visit bethesdagreen.org/be-green-hub/ or contacts its Managing Director, Tina Arreaza at tina@bethesdagreen.org. For more on DGrid Energy, email emfaison@dgridenergy.com or call 240.426.9604. For more on Urbanized, visit www.urbanized.com or email hello@urbanized.com. Staff Engagement Posters Big Hit at Snyder Cohn, P.C. Check out the Green Business Certification Program’s new staff engagement posters ranging from healthful and sustainable lunches, to the Do’s and Don’ts of recycling, to green commuting. Feel free to brand them yourselves by adding your logo and clever tagline. At Snyder Cohn, P.C. we take our commitment to the environment seriously. Although being a Montgomery County Green business isn’t a trivial matter, we love “green trivia”. We recently placed a variety of the Green Biz posters in our catering kitchen and employee lounge and people have really enjoyed the fun facts and trivia. As a matter of fact, the response has been so positive that we plan to incorporate green trivia contests into our monthly internal employee newsletter and will regularly rotate various Green Biz posters featuring green trivia/fun facts throughout our office. Congratulations to Fitzgerald Auto Malls for winning this prestigious award from the Montgomery County Chamber of Commerce. The auto dealership is taking tremendous steps to make its business more sustainable from purchasing 100% clean electricity, to recycling 83% of its waste, to installing high efficient LED lamps. The company’s focus on continuous improvement is institutionalized through its ISO 14001 Energy Management System, a comprehensive set of processes identifying and measuring its environmental impacts and improvements. Check out this video of their environmental efforts. Certified Green Businesses received a great shout out during a recent press event with County Executive Ike Leggett and Barbara Ashe, Executive Vice President of the Montgomery County Chamber of Commerce. The event centered on the launch of the County’s Gift Outside the Box public awareness campaign which encourages residents to give in unique and meaningful ways to minimize the environmental impact of gift giving; create deeper personal connections; and support local businesses and organizations. Public service ads promoting the Gift Outside the Box campaign began appearing on County RideOne buses just before Thanksgiving and ran through the holiday season. The website will be live throughout the year, providing greener gift ideas for every season and special occasion. If you’re a business owner you may have difficulty figuring out how to help your employees green their commute. Fortunately, Montgomery County and Maryland offer significant and comprehensive financial incentives and resources which will enable you to expand employee benefits at a fraction of their full cost, create a better work environment, and reduce your carbon footprint. In the first of a three-part series featuring six Montgomery County Certified Green Businesses we’ll look at companies both big and small reducing their ecological footprint and examine how their efforts help not just Mother Earth, but their businesses as well. This article focuses on AECOM, a Fortune 500 engineering firm with a global presence, and ecobeco, a 25-person County-based business specializing in residential energy efficiency, remodeling, new home construction, and indoor air quality improvement. Many thanks to Raffa for graciously hosting a gathering of approximately 80 leaders from triple bottom line businesses at the Stanford Grill in Rockville, housed in a LEED Platinum building. 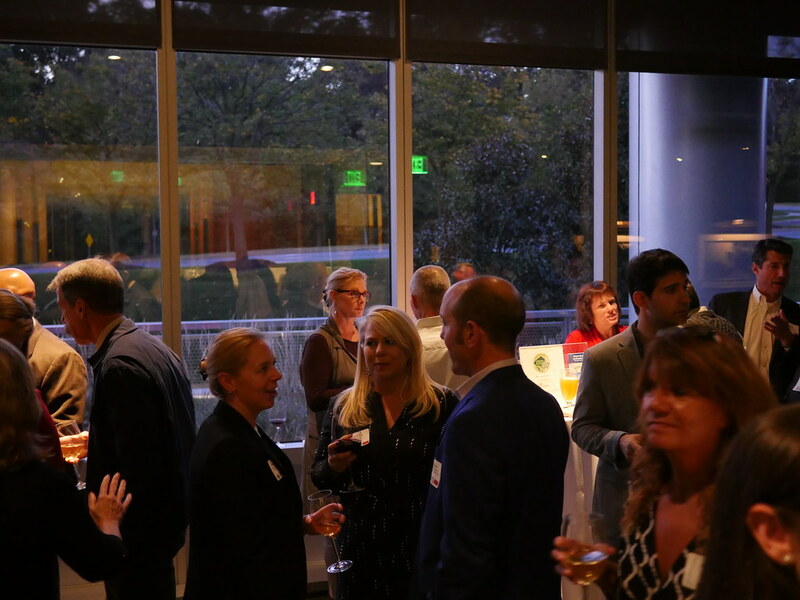 The high-value networking event was designed, simply, to foster and deepen connections among businesses focused on environmental and social impact. The relaxing, elegant atmosphere provided the perfect setting to “connect and cultivate what counts," in the words of the host company, Raffa. Promotional partners included the Montgomery County Chamber of Commerce, the Montgomery County Green Business Certification Program, Bethesda Green and the B Local Mid Atlantic group. The Green Business Certification Program is committed to organizing future events to connect local, County-based businesses interested in learning more about sustainable practices. We welcome ideas and suggestions, and we are always looking for exciting new venues! If you represent a triple bottom line company and are interested in hosting a future event, please contact Doug at douglas.weisburger@montgomerycountymd.gov. On June 5th, County Executive Ike Leggett joined more than 1,000 U.S. governors, county executives, mayors, businesses, investors, and colleges and universities in declaring their support for U.S. leadership in reducing carbon emissions. The leaders sent a strong signal to the international community and the 194 other parties to the Paris Agreement about their continued ambitious action on climate change absent leadership at the federal level. To read the letter go to http://wearestillin.com/. To reduce its own footprint, County Government has increased the number of electric and hybrid vehicles in its fleet, installed solar energy panels on many County buildings, and continues to be one of the nation’s largest local government purchasers of renewable energy. For details on these and other initiatives and accomplishments in energy sustainability in County facilities, see the FY16 Sustainable Government Operations Report. The County has adopted a transportation policy that considers ecosystem and climate impacts, reduces and prevents waste and pollution, and focuses on reducing energy consumption. The result is a balanced approach that includes extensive transit, ridesharing, bicycling and walking opportunities that serve all County residents, visitors and workers. For details on this policy, see Sustainability Policy: Moving Forward Together. In order to help businesses and residents in their efforts to reduce greenhouse gas emissions, the County has established innovative financing tools to increase investments in energy efficiency and renewable energy upgrades through the implementation of a Commercial Property Assessed Clean Energy (PACE) program, and by becoming the first County in the nation to establish a Green Bank. For details on these and other initiatives and accomplishments to promote sustainability in the County in collaboration with residents, businesses and other community-based organizations, see the 2017 Office of Sustainability Annual Report. Fitzgerald Auto Malls, the Coca-Cola Bottling Company Consolidated (CCBCC) Production Facility in Silver Spring, and Montgomery County Government’s Yard Trim Composting Facility were recently welcomed into the County’s Green Business Certification Program because of their certification to the ISO 14001 standard. In the spirit of Saint Patrick’s Day, celebrating all things green, five Montgomery County Certified Green Businesses will soon be promoted for making green business good business. This summer, Goodwill® Industries International (GII), together with other Montgomery County Certified Green Businesses, began using an online employee engagement platform to encourage staff to take a more active role in greening their offices and daily lives. The monarch butterfly, with its striped orange-and-black wings, is an iconic symbol of nature. Monarchs are the most recognized, and beloved, butterfly because of their amazing annual migration and because they were once a familiar sight across the eastern U.S.